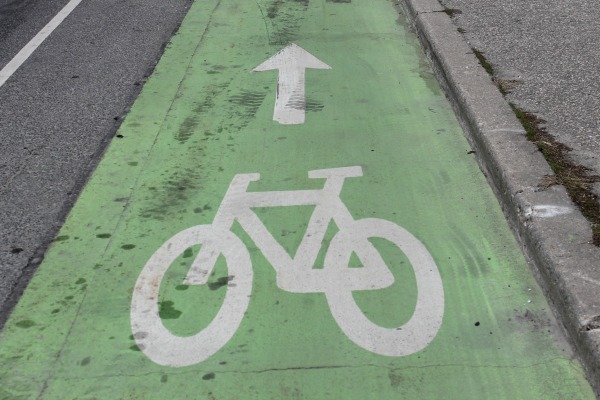 Bike lanes give peace of mind to first-time Toronto cyclists...like me. I am a huge wannabe Torontonian. I moved two years ago from the other side of the country — a small rodeo town called Strathmore, in Alberta -- to attend Ryerson’s School of Journalism. I am entering my third year, but I am sure I still emanate a western prairie-ness that makes me stand out. 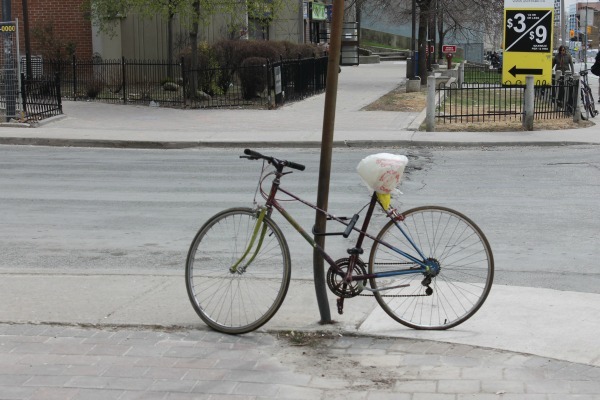 This was my first summer in Toronto and I wanted to learn how to ride a bike downtown. I wanted to explore my new city and I thought being a cyclist would bring me a step closer towards becoming a true Torontonian. So, I needed a bike. I was thinking about a Canadian Tire bike because I knew they have fairly inexpensive models. I figured, I didn’t need anything fancy. But, I wanted to shop around first and make sure I was getting the best deal. 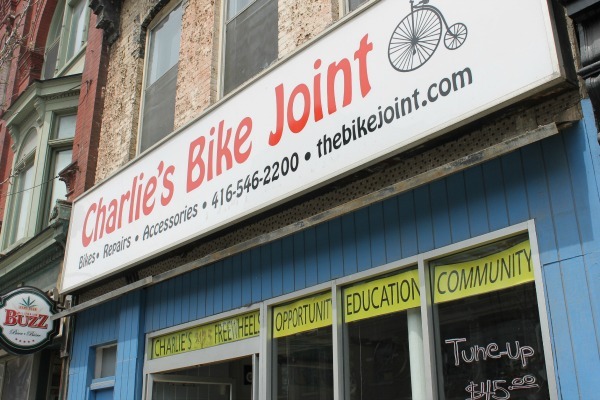 Charlie's Bike Joint at Queen and Sherbourne. I headed to Charlie’s Bike Joint near Queen and Sherbourne streets. 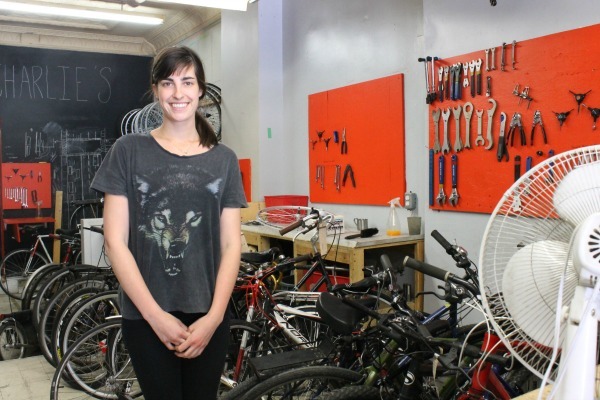 I didn’t know much about the shop except that they build and sell bikes from donated parts. When I arrived I spoke with Charlie’s program director, Katherine McIlveen-Brown. We sat in the back room, past the front desk and rows of bikes and scattered parts. She has smiling brown eyes and her hair was gathered in a girlish side ponytail. I started our conversation by telling McIlveen-Brown about my previous plan. She recommended I buy a secondhand bike and soup it up with quality parts. Kathleen at Charlie's had helpful advice for the first-time rider. She had my attention. I asked she start from the beginning. What does the average urban cyclist need in a basic commuter bike? Panniers are usually positioned on the back end of a bike and are used to carry personal belongings. She said they are a good alternative to wearing a heavy backpack that can sometimes throw off a new cyclist’s balance (not mention the wear-and-tear on your shoulders and neck). Ensure your seat is covered with a plastic bag to maximize security. Try to lock through your frame and wheel. McIlveen-Brown gave me many tips including: put bike lights on a lock or a helmet to avoid forgetting them, lock the back wheel instead of the front because it’s more expensive, cover pricey seats with plastic bags to ward off theft, and plan a route in advance to avoid hitting highly-congested streets by accident. Charlie’s Bike Joint didn’t have any bikes to fit my five-foot-ten frame so I continued my search for two-wheeled transcendence. With the Canadian Tire option eliminated from my mind and having visited a shop that sells used bikes, I decided to visit a shop that sells brand new bikes. Cycle Solutions was in the neighbourhood, near Parliament and Carlton Streets, but I didn’t find anything that fit my super-low $200 budget. The shop has a lot of really nice bicycles priced roughly from $400 to over a $1000. After a week of further searching (now, starting with phone calls to different used bike shops asking about the frame sizes they had in stock) I was still not finding "the" bike. So, I tried calling Charlie’s one more time. The man on the phone said yes, they had a bike my size and, yes, it's decently price at $150. "It's really shiny too," he said. I immediately got excited and exclaimed: I'll be right over! Outside, in front of the shop, there she stood: a beautiful, baby blue, gazelle of a bike. She was gleaming underneath specks of light rain and had a price tag of $150 dangling from the handlebars. The blue gazelle awaits me. I oohed and aahed and right away knew it was the one. I didn’t want to be an impulsive shopper so I made one last trip to a used bike shop called Bike Sauce just to be sure. But I didn’t find anything that topped the blue gazelle. That evening when I walked home, rain was coming down in sheets and my feet were soaked from walking in puddles, but I was in the best of moods — I had my umbrella and I had found the bike. I called and let Charlie's know that I'd pick the blue gazelle up the next day. 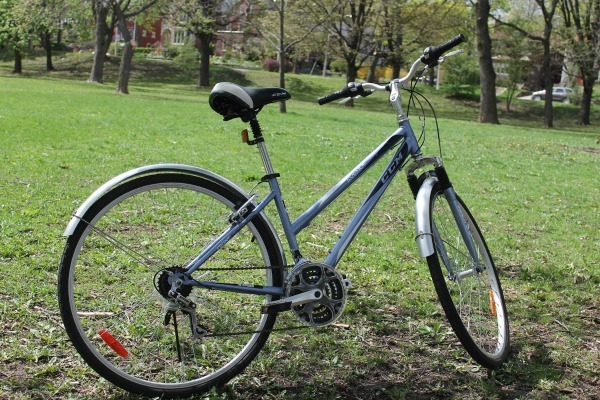 Up next in this series: A new Torontonian's first bike ride. Jenna Campbell is dandyhorse's new web editor and will be chronicling her experiences as she becomes a commuter cyclist in Toronto. She'll ride bike lanes and compare different bike facilities from a "first timer's" perspective. Bike Spotting on Sherbourne at Adelaide: Do you know about the pilot project for bike lanes on Adelaide-Richmond?